By the time the lights came up on the Austin crowd at the SXSW premiere of The Beaver, there were hardly any dry eyes left in the palatial Paramount Theater. They loved it. 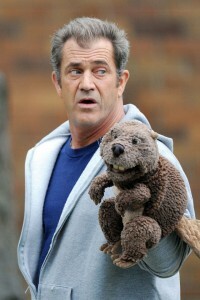 Jodie Foster’s newest film stars herself, the notorious Mel Gibson and a ratty hand puppet known only as the beaver. Gibson plays Walter Black, a depressed toy executive who has become an empty shell of a man for reasons unknown. After being kicked out by his wife, Meredith (Foster), he discovers the curious puppet in a dumpster and turns it into a cockney extension of himself. Kyle Killen’s script made it to the top of the 2009 Hollywood “black list”, an annual ranking of unproduced scripts. It’s no wonder that it was a popular choice on paper, but it’s also unsurprising that it went unmade prior to garnering attention from the Hollywood elite. The Beaver is a study in depression, and the dangers that await if it goes untreated. In a sing-songy voice, Jodie Foster warned the Austin crowd “This is not a comedy…”; she wasn’t kidding. Let’s talk about Mel Gibson. Hollywood is a place where actors are afforded second chances all the time. Just ask Rob Lowe or Robert Downey Jr. or, in time, Charlie Sheen; but Gibson’s transgressions run deeper than being an out of control cad. Moreover, his punishment remains unclear. The first question some of my friends have been asking is “does the film redeem Mel Gibson?” The answer is that it’s a stupid question: nothing will redeem him. A great performance won’t undo his anti-semitism (which I believe is real and raging) or his violent tendencies (more raging). But is it a great performance? I am inclined to say that Walter Black is hardly present on screen in this film, and instead we see the ever-present woodland creature speaking through his body. That’s all Gibson’s work on screen. That he can embody one character and give voice to another, inanimate one is an achievement. It’s hard to explain; he remains understated yet goes big throughout the film. It’s probably his best performance, and I can’t think of another actor who could do what he does in this film. Jim Carrey was an early name that tiptoed around the script. I could see him pulling off the beaver, but not Walter. Take the puppet off Gibson’s hand and he is another character entirely. It’s amazing. To Foster’s directorial credit, there are scenes in which Gibson fights with his hand, has conversations with him and even makes love to his wife that all come off with the proper balance of comedy and tragedy. It sounds absurd, but it makes sense in the world of the film. A script as oddball as this one requires a steady hand, and Foster was only too willing to provide it. Also worth mentioning is a sub-plot in which Walter’s son, Porter (Anton Yelchin), navigates high school while trying to fall in love with the hot yet troubled valedictorian, Norah (Jennifer Lawrence). Porter is a chameleon, known for selling term papers that sound like the person who hired him. Norah commissions him to write her valedictory speech. Part of his process involves finding out about her past, which leads to both characters exploring parts of their psyche otherwise left untapped. It’s an obvious (too obvious, frankly) allegory for the mental struggles of his father, but the plot-line itself works smoothly and the young actors shine on screen. Overall, the film is a heart-wrenching tale of mental disease that doesn’t transcend its message: depression needs to be treated professionally. It’s shocking, but when I peel away the layers of the film, I’m left feeling empty. I think the source of this frustration lies with Foster’s Meredith, who approaches the circumstances that befall her as mundanely as any of us would. Walter and Porter are extraordinary characters, yet Meredith is something of a wet noodle, trying to keep up with the pace of things around her. For the narrative to work, to shock us with meaning, Meredith has to be able to match their extraordinariness. It’s true she provides a window for the audience, a grounded mind through which the rest of us can witness events unfold. That convention, however, is what makes The Beaver a numbing experience instead of an illuminating one. By no means is it a terrible film, just one that inflicts pain on its audience. Perhaps this is what attracted Gibson to it in the first place.